pieczarki. Portobello are pieczarki too. It says here you can even grow it in bottles. Bottles are creative, but I'd rather have a box because more can be grown that way. It looked like there were only a few per bottle in that photo. Looks like you can get many different kinds of mushrooms to grow at home. Thanks for the link. It says you can grow them using a log on a coffee table. That might give them a woodsy flavor and an interesting conversation piece, too. If I tried to do that, my cats would eat them. I would need to put them on the floor in my pantry. There's a variety called Chicken of the Woods or Sulfur Shelf I would like to try. It's got a brilliant yellowish orange color, at least it does in the picture. I found some plugs for Hen of The Woods in the link. I wonder how easy it is to grow them outside, in the yard? Do cats eat mushrooms? I know they like some pot plants, but fungi? Interesting. My cats would definitely bother them. I don't know if they would actually eat them. They might try them, to be sure. They wouldn't leave them alone that's for certain. I read about the Maitake mushroom plugs, they are difficult to cultivate, so I am wondering if I could get them to grow in my yard. I have a stump in my front yard from an old tree, just perfect for mushrooms. I would try an easy variety, first. I wonder how easy it is to grow them outside, in the yard? I don't know, it says they may be hard to cultivate. But the blue ones look cool and they're supposed to be easier. But the blue ones look cool and there supposed to be easier. I am thinking about growing some in the stumps. I have a lot of them and they aren't doing anything so why not try to grow some mushroom in them? It says they are "birch plugs" and none of mine are birch. Would that matter? I would have to grow them inside. "Will grow on a wide range of hardwood logs & stumps and some conifers: oak, elm, maple, sycamore, beech, plum, peach, hemlock, and many others." So it's probably worth a try. Just keep the log moist. And most mushrooms like it warm. Some need to grow in a dark place though, so the pantry might be a good idea. Just check the descriptions and I'm sure you'll find something that would be worth trying out. Ah, them rashers in boletus sauce! Yummy! What about the mushrooms (I don't know their English name), but which are slimy like snails? They are with a white stalk and grey-brown tinge to them. Oftentimes sold marinated. Oh, those are "maślak" mushrooms, family Suillaceae, en.wikipedia.org/wiki/Suillus On the scale 1-10 I would give them solid 6-7. Very good in creamed stews with potatoes. Oh, those are "maślak" mushrooms, family Suillaceae, ... On the scale 1-10 I would give them solid 6-7. Very good in creamed stews with potatoes. Never understood the great wild Polish mushroom thing. I love mushrooms generally and maybe I've been unlucky, but the only wild mushrooms I've had in Poland were preserved and looked and tasted like rubber in phlegm. Really. Yes and yes! This year I was lucky to find many of them. Good season! I already mentioned somewhere I made about 15 jars with pickled maślaks. Their slime is unbeatable. Well the first big mamas look interesting. As for the ones in the jar? yes, thems the bastards. Polish wild dried mushrooms are the best in the world, and I have tried many. But here in the USA these cost a very high price, and are hard to find. I must drive over 60 miles, and pay the high price, but still love them. I have tried to buy direct from Poland, but am still unable to. Can you help me with a source? I have many friends who want me to buy in bulk, and resell them to them, but can't make this contact yet. He must be paid by PiS. Omg, you need to add that pic to the Polish mushroom picking thread..
flaki is the only thing i just couldnt eat, and it doesnt taste anything like octopus pawian. it tastes like congealed fat..it is disgusting!! only had it once in england. got invited to a friends for dinner. her parents are cattle farmers, so was expecting lovely roast beef dinner.....what i got was tripe in milk gravy. just the thought makes my stomach heave. my polish lodger had it for tea last week. i had to leave the kitchen,couldnt bear to look at it. it brought back very disturbing memories lol!! .what i got was tripe in milk gravy. just the thought makes my stomach heave. flaki is the only thing i just couldnt eat, and it doesnt taste anything like octopus pawian. it tastes like congealed fat..it is disgusting!! Nope! Flaki isn`t congealed fat, it is meat! Yesterday I bought and cooked pig brain for the first time in my life. I made myself scrambled brain, sort of. I can say it is true congealed fat. Pawian, any others? My student told me of a Silesian soup which is traditionally eaten on Xmas Eve. It began with 's' but, for the world of me, I can't remember the name of it. Even my wife doesn't know the name of it :) I think butter is a main ingredient. Very nice indeed! Thanks, pawian. Pawian, I'd be grateful if you posted your favourite bakery foods here. There are many hidden gems in Polish bakeries. Pawian, I'd be grateful if you posted your favourite bakery foods here. Do you mean bread or pastry too? 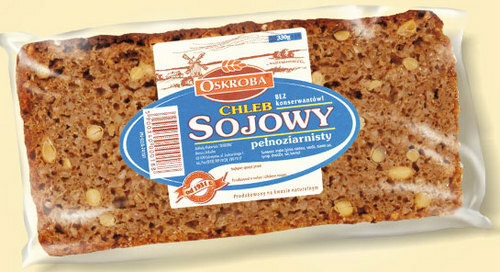 As for bread, my favourite which I buy in Carefour is Oskroba soya bean brown bread: it costs only 2.75 zlotys (matters to me as I am as frugal as a Scotsman from Krakow) per 1 pound and tastes and smells very rich. BTW, I am not scared by GM soya beans threat at all. I'd try it, pawian. I recommend 'noble' bread at only 5.30PLN for 2.2lbs. Have you tried it? Great value for a kilo of good bread!